Naturalists are puzzled by the genealogy of a large, black cat shot this week at Dallas, Moray. The animal was shot by a gamekeeper as it prowled near peasantry on an estate where a similar cat was killed two years ago. The appearance of the animals has sparked a controversial exchange between experts who are trying to determine whether they have discovered a new species or a mutation. Over the past eighteen months four of the large cats have been caught and killed on Speyside and in Moray. 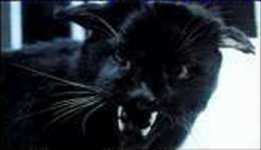 They had glossy black coats with white guard hairs, unusually long limbs, a squat, ferocious head, and bushy tail. The latest example, understood to be a young male, was shot then frozen before being sent by ship to experts who will attempt to establish its genealogy. Officials at the British Museum in London are to examine its skeleton and organs and Mr. Douglas Leighton, at Aberdeen's University zoology department, hopes to conduct tests on blood samples to find a clue to its family origin. Mr. Leighton said his tests, which would take about two weeks, might not prove conclusive. "It may be nothing more interesting than a domestic black moggie who is virtually free and has run amok among the wild cat population and produced a series of characteristics - black coat, long-legged, and thin," he said. It was "unthinkable" that it could be a new species. The latest specimen measures 35 inches from nose to tail, and larger cats have been caught. Some experts believe that the cat is a hybrid, with elements of a wild cat and feral cat. Suggestions that the animals could be an unknown, exotic species have been discounted by zoologists. However, they concede that the appearance of the animals is significant and could prove an excellent opportunity to study a zoological anomaly.